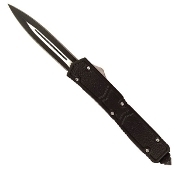 Otf (out the front) automatic opening pocket knife originally designed as a Special Forces combat knife, the blade is double edged Japanese 440 stainless steel. Dual action spring allows the blade to be automatic both in and out. Press the button forward to make the blade shoot out and lock in place. Press the button backwards to retract the blade into the handle.